I’ve always been a fan of how stories evolve, which is why I often don’t watch shows for weeks at a time so that I can watch 4 or 5 episodes in one night. I like the sense of story cohesiveness I get from rapid-fire television viewing instead of weekly viewing (I get impatient). It’s great when shows are episodic, but I like to watch characters and plot evolve and see the series grow as a whole, which is why I’m embarking on a great TV-watching mission this week. 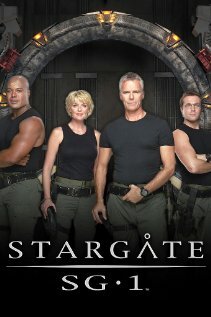 As a Netflix subscriber (and streaming content junkie), I have access to all 10 seasons of Stargate SG-1. I’m now publicly declaring my intent to watch all 214 SG-1 episodes in order, the movies (Ark of Truth and Continuum), as well as 100 Stargate Atlantis and 40 Stargate Universe episodes. And yes, I will attempt to watch Atlantis concurrently with SG-1 to keep as close to the in-show timeline of events as possible. Diana’s Stargate-A-Palooza starts in… 3… 2… 1… [presses play on Netflix]… NOW! This entry was posted in Currently Geeking and tagged atlantis, diana, marathon, review, SG-1, stargate, television, universe. Bookmark the permalink. 5 hours really isn’t much for sleeping, it did take longer than 2 weeks, right? That’s nearly 11 days worth of watching. You really watched 11 days in under 14 days? Only 5 hours of sleep.